← Get fantastic deals at the Jewelry Warehouse Outlet! We have a large collection of jewelry boxes and armoires by Mele & Co.! Storing your jewelry is extremely important in keeping your pieces from tarnishing! Where do you keep yours? 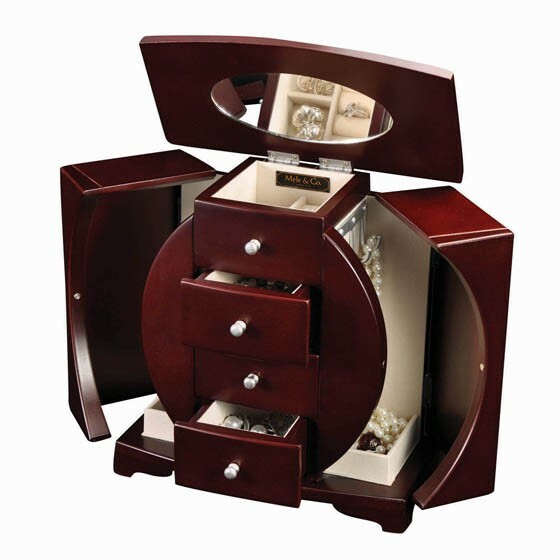 Do you have a jewelry box or an armoire to keep your pieces in? The best place to store your jewelry is a jewelry box away from moisture. You should never keep your jewelry in your bathroom, no matter how convenient it may seem! A suggestion for a wonderful Christmas gift ~ Give your loved one a piece of jewelry or a watch and present it to them in one of our jewelry boxes! This entry was posted in Jewelry, Jewelry News, Jewelry Tips and tagged box to hold jewelry in, jewelry armoire, jewelry box, jewelry boxes, jewelry cabinet, jewelry warehouse. Bookmark the permalink.